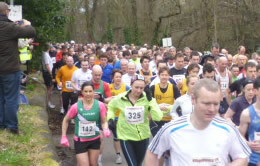 We are a small and friendly club and can cater for all abilities – young or old, fast or slow, male or female. We are always happy to see new faces! We are the running section of the Huddersfield Rugby Union Football Club (HRUFC) based at Lockwood Park, Brewery Drive, Lockwood, Huddersfield, HD4 6EN. We meet on Tuesdays at 7pm for a 7.15pm start and on Sundays at 10am for a 10.15am start. Facilities at the club include parking, changing rooms, showers, lockers and a bar! After the run and a shower stay for a while and enjoy a social drink in the bar. In winter we stick to the roads but when daylight permits we mix it with off road runs on the many footpaths in the area. This is a great way to get to know your way round Huddersfield and the surrounding areas of the Colne and Holme Valleys. Look in the news section to see some of our recent training runs.